The first few Levels of the MyVegas game are easy to progress through, and you can very quickly proceed through, and build your first four MGM Resort Properties: Monte Carlo, Circus Circus, New York New York and the Mirage. Having a MyVegas “V” symbol show up on the screen, starts you collecting the various architectural elements to build your own MyVegas virtual Las Vegas Strip. The first Hotel Resort you build is the Monte Carlo. Once you have collected all the pieces, you get to go ahead and build your first Resort… which you can then visit, after certain time intervals, to collect free Chips. As you progress to building the various Resort Properties, more “V” symbols are required to complete each phase of construction. Once you have access to your MyVegas Strip, you can collect Chips at regular intervals, from the MGM Resort Properties you have built (as well as a few other venues: a Wedding Chapel, Helicopter Tour Company and Black Jax Mini Mall). The times between Chip collections vary, depending on the Resort Property… but as with the REAL Las Vegas, time seems to fly by. In the above example, you would “click and pull” yourself around, using mouse. If you are too early, there won’t be a Chip/Loyalty Points icon, but when you mouse over the Property, it will show a banner, (like the one above) indicating the amount of time until Chips can be collected. 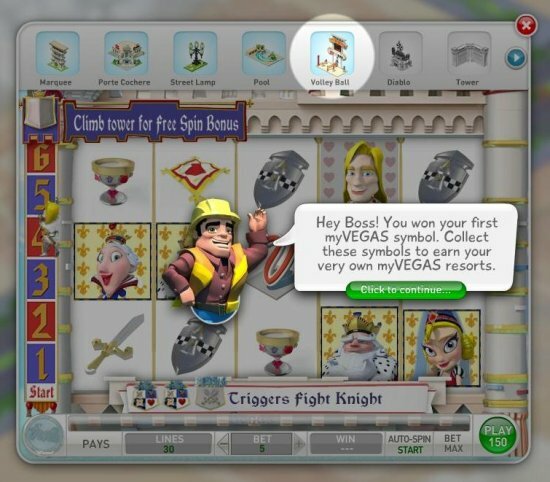 As you progress through the Levels in MyVegas, you get to play different games, use increasingly bigger multiple spins, and build more MGM Resort Properties. As you continue to build the different Casinos, the newer Properties will give increasingly higher Chip rewards. (And you will need a bigger stack of Chips, as you progress into higher Levels, where there are larger gaps between Levels and Property bonuses.) However, the time interval increases, along with the Chip value, so you can’t collect from the MGM Grand (for example) as often as you can from the Monte Carlo.